Kate Dube. Photo by Samantha Wilson. Third Life Studio, Somerville, Massachusetts. There doesn’t have to be music, a “score”, for there to be dancing. A journalist reportedly once asked Trisha Brown why she sometimes doesn’t have a score to accompany her pieces, to which she responded, “Do you walk around a statue and ask why there’s no music?” A score can, however, enhance the meaning and emotional effect of the dance it accompanies. Caylee Dorr. Photo by Samantha Wilson. 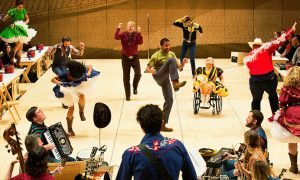 Scores can also be so much broader than songs – narration, live instrumental and voice, and more can all add an auditory layer unto movement. 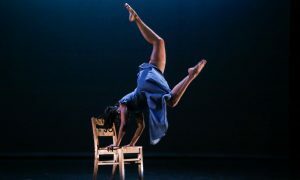 A Third Life Choreographers Series installment exhibited various ways that sound can bolster movement, coming together to create the art of dance performed. All pieces had a notable joining of music and movement, and were overall commendable in their own way. This review will highlight four of those pieces. The second work, “Night Visiting Song”, unfolded around the simple aesthetic of three women sitting around a wooden table. They each had different roles – one singing, one moving, one tapping out a rhythm in Irish step dance shoes. The singer, Julia Friend, offered a strong, rich song in a capella. Rebecca McGowan kept a consistent, clear rhythm, with some dips and shifts, in her tapping. Veronica Barron moved with pedestrian simplicity, yet overflowing tenacity. Melting forward and backward, pulling a cup toward her and pushing it away, her anguish seemed clear. Friend’s song told of coming to experience joy and love, yet also the pain of having to leave. Everything was shaped such that many narratives could grow from what they offered. Specificity somehow joined with simplicity to make this possible. Absent such many narratives, what they offered was enough. It was a compelling piece of art in its own right. 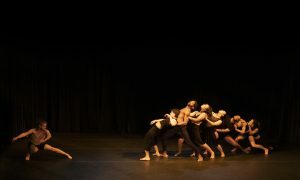 Two pieces later was “Ongoing”, choreographed and danced by Alicia Condon and Danielle Sinsigalli. They were big and bold in their movement, daring to be expansive. On the ground, there was a sense of skimming over the floor. They rode the beats of the music like waves, smooth and right on top. As the music picked up, so did they, yet without a feeling of tension or strain. It was a clear example of how music and movement can be in harmony. Abilities Dance. Photo by Samantha Wilson. There was a psychological element to the work as well. At times, there was a feeling of interiority – of looking inside, and seeing what possibilities lie within their very body. They seemed always at the “edge” with discovering these possibilities – constantly finding but always more there to find. At other times, gaze was strongly outward. Having looked inside, they could look outside with more clarity and strength – a powerful message and example. One thing to be refined is the ending, which felt abrupt. They used many gestures in the work, and perhaps they could draw down to posing in one of these to end the work. Abilities Dance performed another work showcasing a powerful marriage of movement and music, “Boss Women II”, next in the night’s program. A company statement describes how it’s “designed to provide a professional platform for dancers of all physical abilities. 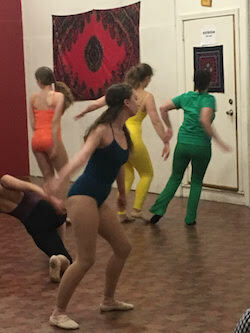 Rather than creating the choreography and casting dancers to fit that mold, we create the choreography to emphasize the dancers’ strengths and build on their limitations.” In a circle, separate dancers came out and danced solos of unique movement. Accents in music correlated with accents in movement, creating punches of asserting personal presence and power. Slower movement extended in ways that it rode the lilts in an underlying musical harmony line. Also each in their own bright color, their individuality was clear. Later on were unison phrases, but before long separate pairs were doing their own movement. The final soloist, still moving as these later sections occurred, captivated attention. With incredible grace, speed and agility, she kept unwrapping new surprises or seemingly impossible things her body could do. To end, they all clustered on the group, in support and protection of each other. Hana Kazuka. Photo by Samantha Wilson. 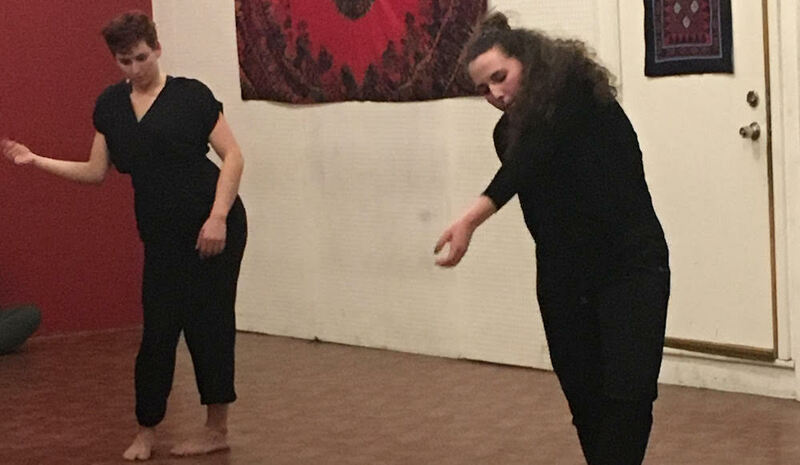 More toward the end of the night’s performance, “The Lineage”, choreographed and danced by Hana Kozuka, paired expressive and daring movement with narration from Beyoncé’s Lemonade. The voiceover described a grandmother overcoming a lifetime of struggle and pain through what she could create in the kitchen. “Grandmother, you alchemist,” Beyoncé lauded. Kozuka turned, lunged and melted to the floor to match the narration’s emotional intensity. 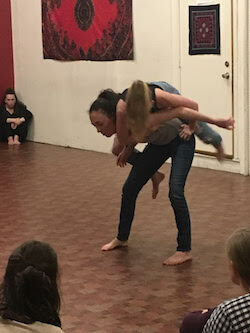 Within all of this technical difficulty was not a hint of struggle or hesitation, not even with a backbend from standing to melt all the way to the floor. The grace and power together was astounding. The ending was just as poignant and thoughtful; she crouched with one knee up, the other shin down, hands over head, facing the back. The narration spoke of how there were always voices telling us about our own strength, “but we can’t hear them.” We are often stronger and more capable than we know. This effect couldn’t have come from narration or movement alone. It was only possible when they came together. 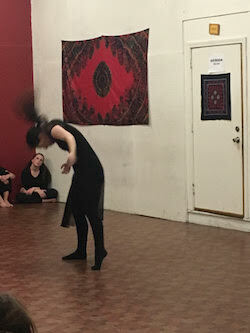 This installment of the Third Life Choreographer Series, at large, demonstrated this powerful truth in the art of dance.